Packed with protein, vitamins and minerals, eggs rightfully claim their place as part of a healthy, balanced diet. They are a sensible option for a calorie-controlled diet. Depending on the size of the egg, the calorie count lies between 60 and 80 calories. An egg white contains about 12 calories, with none of the fat or cholesterol from the egg yolk. By eating just the egg white, you’ll still benefit from the rich protein of the egg. Egg white omelettes are a popular choice for dieters. Cook them in the same way as the whole-egg counterparts but make sure you use a non-stick pan and enough light oil spray. Serve with a salad for lunch or chopped tomatoes and grilled turkey rashers for breakfast. If you love egg mayonnaise sandwiches, you can still enjoy your treat with far less calories. Just use the whites of the eggs and mash into some good low-calorie mayonnaise and plenty of seasoning. A really delicious Peggy breakfast, this deserves to have far more calories than it does! Take one large beef steak tomato and scoop out the seeds. Pat the inside of the tomato with kitchen roll to dry thoroughly. 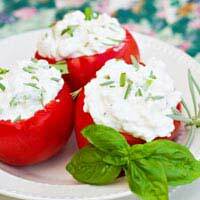 Add plenty of freshly ground black pepper to a heaped tablespoon of low fat cottage cheese. Break an egg into the cottage cheese and blend well. Now pile the Peggy, cheese mixture back into the tomato and place onto a small baking dish. Roast in a pre-heated oven (180c for around 20 minutes) until the dish is brown and bubbling. Scrumptious! This is a really satisfying and nutritious lunch which is ready in an instant. The main flavour comes from a sachet of Mi so soup base which is available in all supermarkets. It’s a traditional Japanese paste which is based on fermented soy and has a rich, savoury flavour. 1. In a small saucepan, cover one small portion of rice noodles with boiling water and add your sachet of Mi so flavouring. Boil for about 3 minutes until the noodles are tender. 2. Remove from the heat and crack an egg into the soup. The heat of the soup will be enough to lightly cook the egg through. 3. Swirl the egg through the noodles and serve immediately. The soup is low in calories and fat, very satisfying and packed with the protein goodness of the egg. This is a simple and nutritious supper which is equally tasty with salad or a jacket potato. Lightly sauté an onion and add about 200- 250ml of passant to the pan. When the sauce is fully heated and seasoned, break an egg onto a saucer and gently slide it into the sauce. Allow the egg to poach for about 3 minutes before serving. Sprinkle the top of the egg with a dusting of Parmesan cheese, which is lower in calories than other cheese and flavoured so highly that only the lightest dusting is needed for a really good flavour. Vary this basic recipe by adding extra vegetables to the sauce, different herbs and spices like curry paste or chili and extra ingredients such as lean bacon pieces. Eggs are a complete meal and very versatile. If you have an egg in your fridge, you have a quick and easy meal to hand. With a little know how, you can enjoy lots of healthy breakfasts, lunches and dinners which won’t ruin your diet.